The paper compares the following five local taxes in the Tamale Metropolitan Assembly (TaMA): Rates, Lands, Fees and Fines, Licenses and Rent. The case shows the inefficient manner of local revenue mobilization in TaMA which however is endowed with broad revenue bases. The study asserts that the functions in the local tax chain namely: definition of tax bases, tax base valuation, tax assessment, tax collection, tax enforcement, tax appeal and taxpayer education or services are not been properly conducted. The system is characterised by unprofessionalism and the use of discretion of tax administrators without following established standards. Hence the telling negative effect on utilizing the broad revenue bases. This study revealed that the revenue assignment policy of LGs in Ghana and administrative or managerial choices are the difficulties that influence local taxation negatively. It has been confirmed that the taxes in the metropolis are potentially viable and buoyant capable of meeting the cost of some local needs if properly harnessed. This gives credence to the much held opinion that metropolises unlike small districts have potentially viable taxes but that the problem has been largely with the management of these taxes. The study also confirms rates as the most viable local tax followed by fees and fines, licenses, lands and finally rent. The position of land related taxes is because of the domain of responsibility of taxation which in this case is in the office of stool lands and not TaMA. 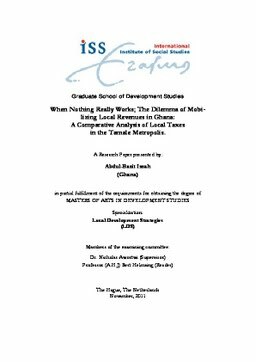 Finally, the study brings to the fore how other constraints influence efforts of TaMA in local revenue mobilization. These factors include CG regulations, expenditure assignments of LG, CG transfers and the cultural and ethnic problems in the area; the others are corruption and political patronage, inadequate capacity and logistical constraints and poor financial management expertise; the rest are transparency and accountability and poor monitoring and evaluation of local revenue mobilization strategies.